In the past, I’ve been very tempted to invest $200 or so towards NeatReceipts, the paper-to-digital filing system you probably recognize from the SkyMall catalog. Problem is, I already own a scanner—and I just can’t bring myself to spend that much money on another one, regardless of how much easier it’ll make my life. But after reading grooveDexter’s post on Google Adding OCR Support for 34 Languages, I got an idea. Why not use my iPhone and Google Docs’ OCR capabilities and roll my own digital receipt filing system? 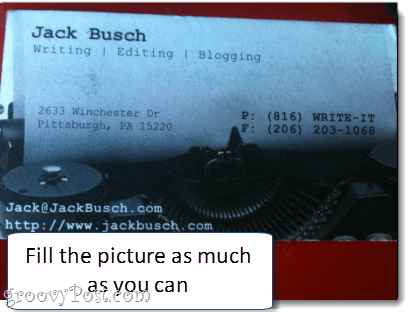 I can just snap photos of my receipts and business cards, upload them to Google Docs to get them OCR’d and then plunk them in a special collection, which I can search by keyword as needed. You don’t need a scanner or a computer to capture documents. As anyone who has ever tried to implement an inbox-driven system knows, having an effortless and always-available “bucket” is key. And this is where this mobile NeatReceipts alternative really shines. All it requires is a phone with a camera on it—a smartphone with Dropbox installed is even better, but not required. To collect data, simply snap pictures of your business cards, receipts or any other paper record you want to file away in the cloud. This is actually a really critical step. You want to make sure that you get the clearest shot possible. Do your best to get the entire document to fill the picture. Make sure it’s well-lit with no glare. Also, make sure the text is in focus. If it’s blurry, too dark or cut off, take it again. Try it in landscape mode if that works better. Unfortunately, there isn’t currently an easy way to get your photos into Google Docs directly from your iPhone. That’s why I recommend using Dropbox, since it lets you upload photos right into your Dropbox folder. You can take the picture from within Dropbox and upload it instantly, or upload existing photos from your camera roll into a folder of your choosing. You can, of course, sync your photos the old-fashioned way, using iPhoto or Windows Live Photo Gallery. But part of the allure of this solution is that you don’t have to be wired to a USB port to make it work. 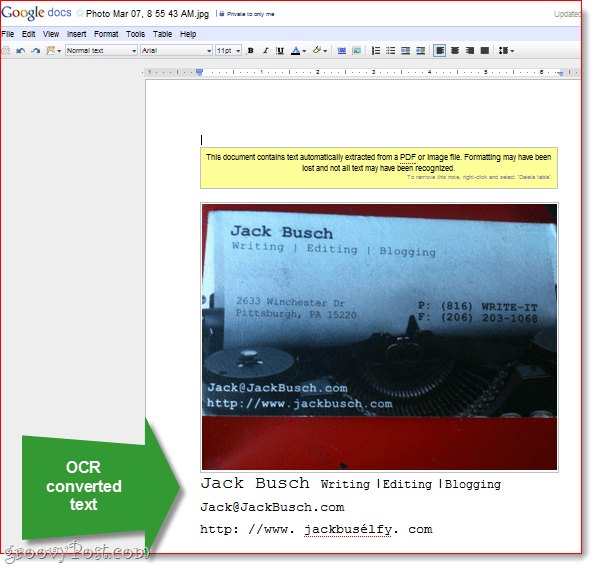 Now, all you have to do is upload it to Google Docs and enable the OCR capabilities. 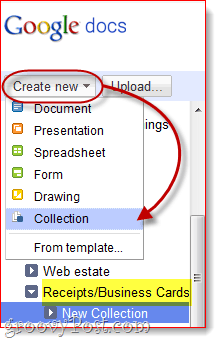 But before you do this, it’s a good idea to create a collection specifically for your OCR’d documents and receipts. This will make it easier to search them later. I called mine “Receipts/Business Cards” but you can name yours whatever you want. 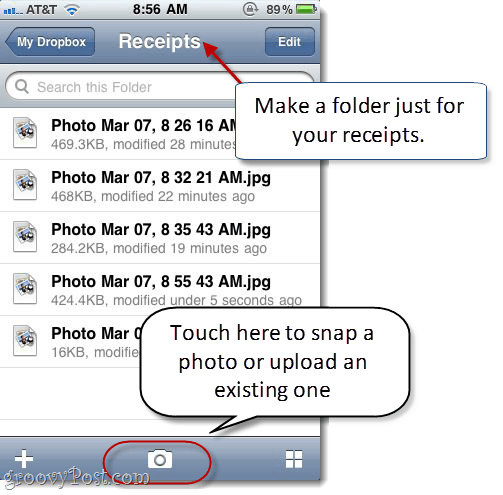 …and choose the receipts and snapshots you want to upload. 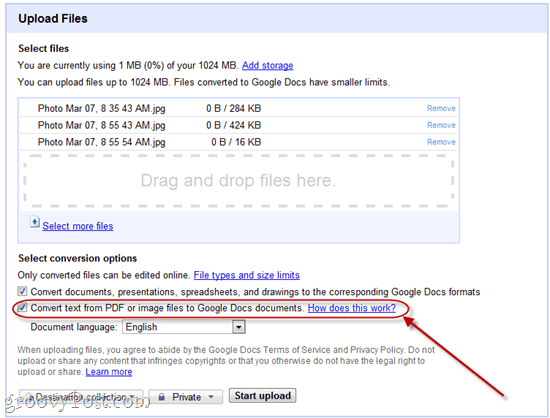 The key thing to do here before Clicking Start upload is to Check the box next to Convert text from PDF or image file to Google Docs documents. Also, make sure you choose your language in the drop-down menu below, if you are using a language other than English. Alright! 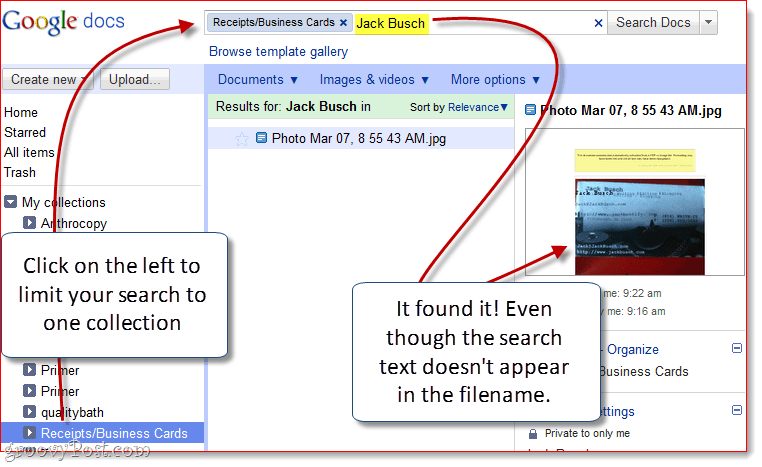 Now you’ve got your business cards and receipts in a searchable, archived Google Docs folder. Open one up to see how Google Docs did. Here’s the example I did. As you can see, it pulled out the text on the white background fairly easily. It had some trouble with my URL, but overall, I declare this effort “not too shabby.” You can go through and make corrections by hand, as needed. So, even though Google Doc’s OCR isn’t perfect, it’s good enough to make it easy for you to find documents via a keyword search query. No matter how you slice it, that’s a lot faster and easier than thumbing through an alphabetical file cabinet. Okay, after all of this, I admit that I still kind of want to buy NeatReceipts. My inkling is that it’s much better at parsing out text on documents and will probably do a better job for larger pages. 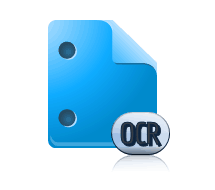 Plus, Google Docs OCR has a big limitation, in that it can only work on documents up to 2 MB. Practically any PDF will break this limit. But one workaround is to convert your PDFs to a smaller size or color depth (I made them 33% and grayscale) using a tool like the Snagit Batch Image Conversion Wizard. You could also try Evernote, which also has OCR for recognizing text in images, plus a mobile app that lets you upload directly from your phone. But overall, I’ve found that Evernote’s OCR plods a little bit—it doesn’t convert right when you upload, and I’m not entirely sure when it does process your images. 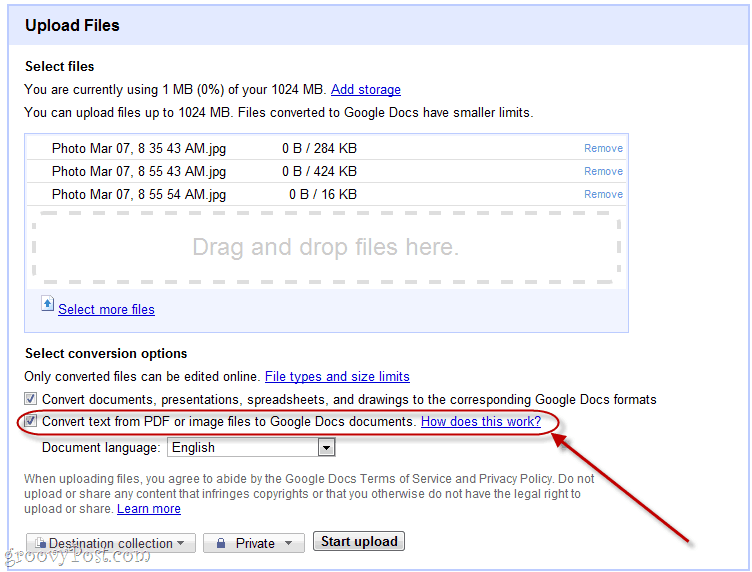 For now, Google Docs is the fastest method, even though it involves an extra step for uploading. 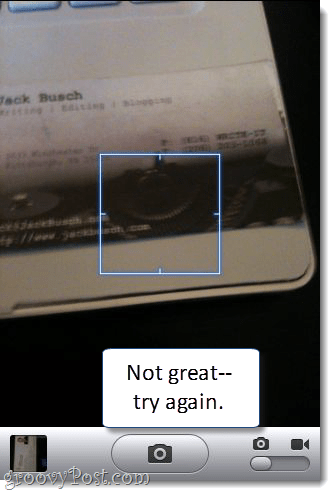 I tried doing this with my scanner, and then uploading to Google Docs, and frankly, the OCR is just TERRIBLE! It didn’t read any of of the numbers on my receipts, which rendered this whole thing useless. I would like to buy NeatReceipts, but my only problem with doing so is that when exporting to something like Microsoft Money, the receipts that are split in NeatReceipts become separate transactions in Microsoft Money. That would make it a real pain because I have to either edit them all over again to make it one transaction, or I would have to calculate totals when going through my bank statements (which would make things confusing)! As a current owner of Neat, it ain’t all that neat. The scanner is unpredictable, often requiring re-calibration, or you’ll have big vertical lines in the middle of your documents. The neat software (latest release) is faster than the previous version, but still is limited to only using one CPU on a i7 quad core machine. So processing of documents is slow. Often I will have 30+ documents in queue. Instead of waiting I go to bed. Sometimes it will process all of the scans. But more often than not, it will blow up in the middle of the queue, leaving me with the re-scanning of all that paper. The OCR in neat is basic, it can’t read a prescription receipt from Walgreen’s. It will often pick up some other number (like stock number, or UPC) and use that as the price. So, each receipt has to be checked and edited. How many times does one need to handle a receipt before it can be filed away? The scanner often jams, crumples paper or reads the paper askew. The software is supposed to fix these errors, but it doesn’t do a very good job at it. Don’t think for a second that neat desk is the “end all” of automated receipt handling. Because in MHO it’s fair at best. Thanks for the feedback Dan. I’ve been looking for a way to simplify my paper at the house and so far I’ve come up flat with something that works solid and is simple. Honestly, it works pretty well and it’s integrated with Dropbox so it makes the whole process fairly simple. If my Neat mini-scanner worked as advertised I would be a happy camper. Unfortunately the little green light won’t even come on now. This is my third mini-scanner. One would think I’d learn. I really like the way the library keeps things. It is to my liking. However, I now have El Capitan on my iMac, and the whole Neat system is incompatible. Neat offered a “bridge” program, but it is worthless. I’ve uninstalled and reinstalled the software at least twelve times. To no avail. In addition, in order to talk with a Neat representative on the phone is impossible. Why? Because they have no Help Desk at all. You buy it, you live with it. I come just short of calling the entire Neat outfit a scam, but I don’t communicate well with computers on the other end of the phone line. Buyer beware. You might like your program for the first month, or even a little longer, but you will grow to hate the entire thing within a short period of time. Thanks for the the NeatReceipts free alternative. I needed a quicker and faster solution than scanning individual receipts one by one, so I searched around and found an alternative which allows me to just stuff all my receipts into an envelope, ship it over for free and basically just watch all my paper clutter transform into digital data.